Ben Collins holds sway over many a car. 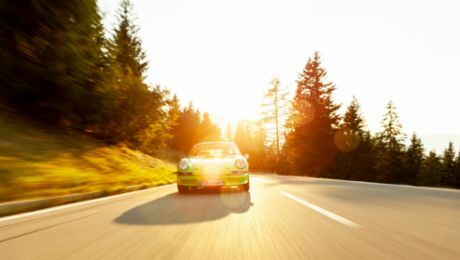 The Porsche 911, on the other hand, holds sway over his emotions. He was a stunt driver in James Bond and Batman blockbusters including Quantum of Solace, Skyfall, Spectre, and The Dark Knight, and he took over the wheel for Tom Cruise in Mission Impossible. In his 2010 book The Man in the White Suit, the forty-three-year-old Englishman revealed himself to be “The Stig” in the British cult series Top Gear and, after seven years and 101 episodes, removed his helmet for the first time. Love is something you can't live without and sometimes drives you crazy. I love racing, but I really love my wife and my kids. Still looking for the next big chase. It mightbe Le Mans or a film or a book—or if I hit the jackpot it could be all three. That would be really good. 3. How would you describe a Porsche 911in a nutshell? The 911 is a surgical instrument as well as a sledgehammer—tough but precise. Food and gaming are right up there. I love cooking good food and shooting aliens, which is a break from my day job as a handling consultant for Project Cars—the world's most realistic racing simulation game. Waste a thought about selling it. Once you've got the right one, keep it. Pacific Coast Highway, California State Route 1. The kind of place you don’t need an excuse to be. The black stuff canters along the coastline, scythes through the mountains, and lives up to its reputation as an all-American treasure. The roadside diners serve my kind of food—and to sniff them out you need the roof down. I don't like heights much, but having a reason to go somewhere usually removes the fear of doing it. Music, a speedboat, and some Tabasco sauce. Positive people—they pop up everywhere when you least expect it and make you realize what life is all about. Nothing. That's the beauty of the 911. It's like a Spartan warrior and there are no spare parts. The insane engine and the hand brake. For me the ultimate Porsche was the 997 Turbo. Having the ability to control all that power with a few levers and pedals is the source of pure joy. I won't be selling mine. Something about self-driving car technology being brought to market too fast and electric-powered cars taking too long! A gift from the British Army. That's like choosing between gravity and sunlight. I love both, but once you've had freshly sourced South American coffee, nothing tops that. I spent a week on the Isle of Man filming with Top Gear and the grand finale was a three-way time comparison between a 911, an Aston Martin, and a BMW. The fog came down heavy for my run in the 911, and I left my braking too late for a corner that crossed a stone bridge. As I turned in, the rear of the car was floating across the bumps, right on the edge, and it just glided through. I remember the sense of confidence it gave me—and the 911 posted the fastest time. Never give up—the longer it takes, the longer it lasts. Counting backwards from one million in Ancient Greek. And they'd be right.